Looking for a top-flight fantasy football trophy for your league? 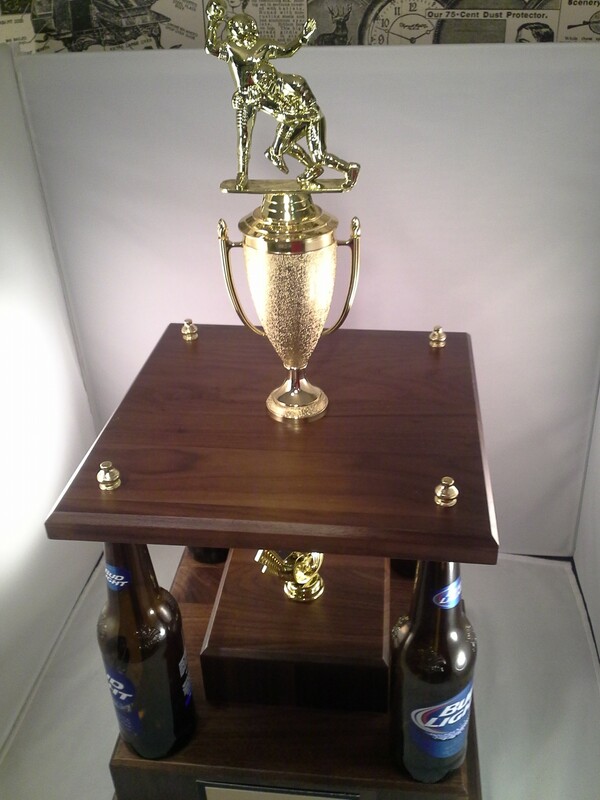 This all-wood trophy is the choice of many leagues. 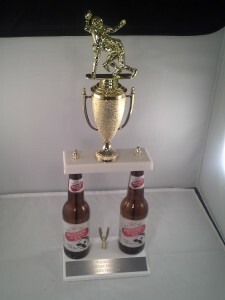 It is the choice of a new league in Rockville, MD. Enjoy guys! You like beer? Yes! You like football? Yes! Then you’re gonna love the Quad beer-post fantasy football trophy. What goes together better that beer and football? state in the US. This one is off to IN. 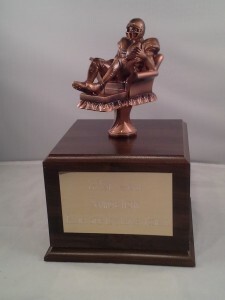 I don’t know who Chris Sauls is but his buddies have decided to memorialize him with the Ultimate Fantasy Football Trophy. We get a lot of memorial requests. 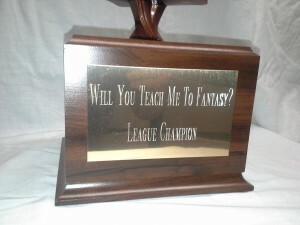 I’ve had many fantasy football draft board dedicated to a lost league member. 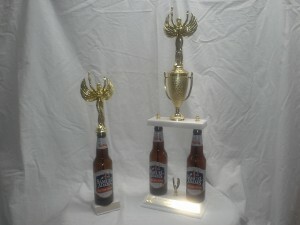 Beer bottle trophies aren’t just for fantasy football anymore. 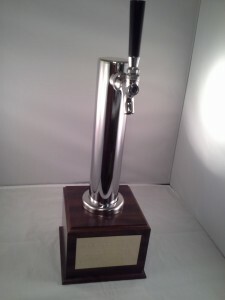 Boston Beer Company asked us to make a few for an upcoming bartender competition at TGI Fridays. We’ve worked with Boston Beer before and several other brands. Not just for fantasy football anymore! 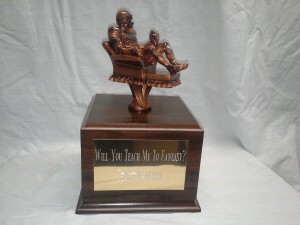 This is the last Ultimate Fantasy Football Trophy we’re shipping today. This league is off to a good start! Yes, our Aussie friends love American Football! I love Australian Rules Football! I still miss watching matches in the wee hours of the morning on ESPN between the Magpies and the Black Ducks! Why did ESPN stop broadcasting it? Maybe the new Fox Sports1 will have it. I understand that Rupert Murdock has a little pull in Australia. Anyway, it looks great and will be off for it’s long journey “down under” tomorrow. G’day mates! Do they have Australian Rules Fantasy Football? 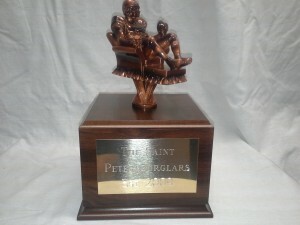 Ultimate Fantasy Football Trophy: AGAIN! 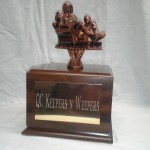 Yes, we’re shipping a lot of these fantasy football trophies. This one is off to the state of IL. Enjoy! This one is off to IL, land of Lincoln. 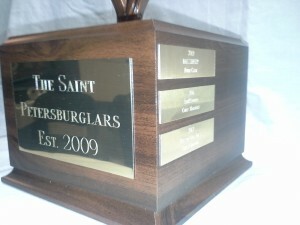 I get asked often, “What is the best selling fantasy football draft board on your website”. Since they are all customizable, the only way I can answer that question is by which one sells the most. And that is our 12 Team, 20 Round fantasy football draft board. The second best seller would have to be our 14 round 20 team board.